1. International research shows that being bilingual helps intellectual and cognitive development. 2. Students who are bilingual can often have enhanced self esteem. 3. Students who speak Irish understand their own cultural identity as Irish citizens and as Europeans. There is a better chance that they will understand and respect people of other races and cultures who speak different languages. 4. being bilingual will help the student learn a third and fourth language. 5. Being bilingual means that there are enhanced employment prospects for students. Language is never a barrier to learning, insists Risteárd de Barra. And he ought to know.Schooled through Irish and a teacher of Irish, Mr de Barra is principal in two schools -- the Vocational School in Newcastle West and the town's Gaelcholáiste Uí Chonbá. This leaves him in the unusual position of being able to offer choice regarding second-level schooling, a position which he is happy to promote. "A lot of people are pro-Irish and the demand for second-level education through Irish was there from parents and from the Gaelscoil," he said explaining the background to the setting up of the Gaelcholáiste eight years ago.But he argues that, though most parents and pupils choose the English option, all-Irish schooling is not a burden for students. It will not hamper them at third-level and there is evidence that being bilingual is good for students' self-confidence.He is equally insistent that all-Irish schooling should not be regarded as some kind of elitist education reserved for high-flying students. The múinteoir-i-bhfeighil at the Gaelcholáiste, Siobhán Ní Chonchúir agrees. In her eight years as a teacher in the school, she has seen pupils of mixed and all abilities pass through the classrooms. "We are not cherry-picking. We have all abilities in the school," she said. 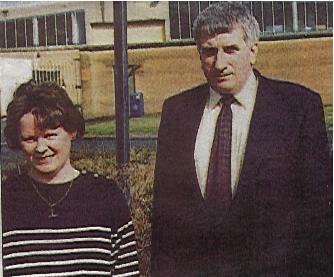 But she believes that the school's small class-size is of huge advantage to all pupils, ensuring more attention for both the weaker student and the high-performing student.And though most, though not all, of the school's current 73 pupils, came through the Gaelscoil system, this was not a prerequisite, she insisted. The key factor in helping children absorb knowledge through a language which is not their first language is, according to Siobhán, the creation of the right atmosphere within the school.For the most part, she said, pupils were not aware whether they were thinking and speaking in English or in Irish. "While they are taught through Irish, they would also have the terminology in English," she said.Set up with nine pupils in 1993, the Gaelcholáiste has grown to 73 students, has seen three classes succeed to Leaving Certificate level and will move into a new home later in the year.This new home will be close to the new vocational school currently under construction and due to open in September. But the new Gaelcholáiste will have its own mini-campus and its own entrance. The reason for this, said Mr de Barra, was to preserve the identity and ethos of the Gaelcholáiste.However, pupils will share the new facilities coming on stream in the vocational school, including the sports hall and specialist rooms.